Our Maersk tracking system allows you to track your Maersk Container cargo by entering the Bill of Lading or Tracking Number (or Booking Reference Number). The track and trace system provides details about searched container cargo location instantly. The online tracker will redirect you to Maersk Container Tracking Page after clicking the track button. Note: Maersk tracker system supports Domestic and International Maersk Container tracking. Bill of lading number (also called BL Number or BOL Number or B/L Number) is required to track your container or vessel. Maersk Tracking is maybe the most searched vessel tracking criteria today. Main reason is that Maersk is one of the biggest container ship owners and Maersk Tracking is an important feature for everyday operations of maritime business. Maersk Line is a global container division and the biggest operating unit of A.P. Moller – Maersk Group. The line provides ocean transportation all over the world and serves clients through 374 offices located in 116 different countries. Maersk company has 23,000 land-based employees and hires 7,100 seafarers. The line operates 604 container ships. Maersk Line is part of Maersk Group, with headquarters in Copenhagen, Denmark. The Group as a whole employs around 89,200 people in nearly 130 countries. Its 2014 revenue is US$ 48 billion. 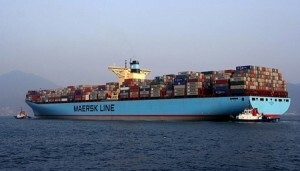 Maersk Line’s biggest ships now sailing the world’s oceans are the vessels of Maersk E-class, which are 396-metre long. The secret of the size of the Triple-E lies in the sheer bulk. Through amazing engineering performance, the Triple-E’s expanded inside cavity (able to hold 18,000 20-foot containers/TEUs), gives a capacity that is 16% greater than E-class ships, equivalent to 2,500 more TEUs. Showing 1-100 of 379 items.